This description of Sachin Chaudhary's work was prepared when Sachin Chaudhary was elected to the Ashoka Fellowship in 2018. Sachin is engaging people in self-assessment and self-management of mental illnesses through a preventive lens that enables individuals to track their own wellbeing. With 14 percent of India’s population suffering from mental illness and a limited supply of mental health professionals, Sachin realized the need for a preventive approach to tackle this growing problem. He is making tracking of mental healthcare indicators as commonly accepted as that of physical health indicators. Eighty percent of mental health disorders are considered common disorders, such as depression and anxiety. If undetected or unaddressed, such issues can grow into significant problems or even put people at risk of more severe mental disorders. But such issues also often respond well to preventive measures and in many cases can be effectively self-managed if people are equipped with the right resources. 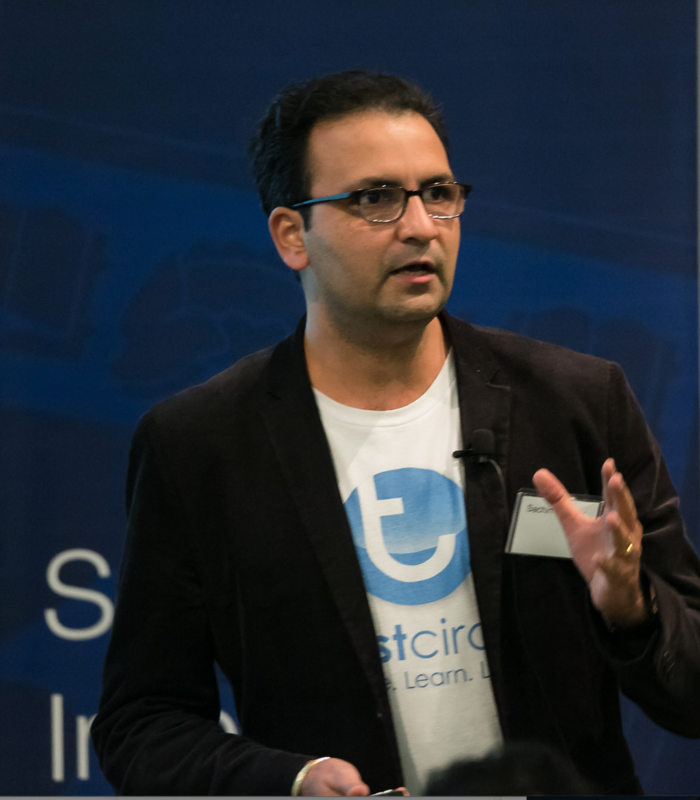 Through TrustCircle, Sachin is empowering people to take control of their own mental well-being by making widely available the knowledge that previously sat in the hands of medical professionals and research institutions. TrustCircle puts scientifically validated mental health screening tools and information resources in the hands of anyone via encrypted digital technology, enabling people to measure their mental well-being at any time and at no cost, and then to track their status over time, all safely and anonymously. Users are directed to resources based on any concerns that emerge from the screening and have access to an online community of support, where they can connect with others wrestling with similar issues, as well as social workers and other professionals. This community provides a place for people to speak openly about their mental health and seek social support in a society where mental health disorders are highly stigmatized. Alongside the technology, Sachin is building a model to foster a preventive care ecosystem that is integrated with curative support resources to ensure those who need treatment once screened can access it. While anyone can access TrustCircle’s screening and self-management tools as well as the online support community, Sachin is focused on using the technology in partnership with institutions that have interest and capacity for treatment with their community of users. These partners can integrate the self-screening and -management tool with their own care and treatment resources, ensuring users can access care if needed. At the same time, the aggregate data generated enables these partners to spot trends and optimize their resources for care and support. Through this model, Sachin is enabling organizations to change their culture through the power of prediction of certain prevalent disorders that are pushing their employees, students, beneficiaries to mental illness. He is empowering these organizations and communities with real-time mental health analytics to focus sparse resources where they are needed most. One in five of the working age population is estimated to be suffering from mental illness and 85 percent of employees still feel uncomfortable discussing their mental health well-being in the workplace. The decline in emotional well-being is one of the worst problems our society is facing today and is leading to a global epidemic. The taboo associated with mental illnesses results in social isolation and lack of support systems for the patients and their immediate circles. The economy is battling an invisible enemy which is the stigma around mental healthcare. 80% of mental illnesses are common mental health disorders, like depression, anxiety and stress, which if not treated at an early stage can tip into severe mental health disorders like schizophrenia and dementia. In developing countries, 75 to 85 percent of people with severe mental health conditions do not have access to needed mental health treatment. Mental health services in developing countries—where they exist at all—tend to focus on the diagnosis and provision of treatment for an individual. Historically access to mental healthcare is given only on a curative basis and there are very few tools that allow individuals to track their own emotional wellbeing. As a result, most individuals recognize the need to seek help only when it reached a stage where it becomes a barrier to their daily lives. There is no focus on prevention and prediction of mental illness. With a huge taboo associated with mental healthcare, there are no circles where individuals who suffer from mental illnesses and their caretakers can share their progress and personal solutions to build emotional resilience. In India, there are only 6,000 certified psychiatrists and less than 3,000 psychologists. There is a lack of assessment capacity and hence there is a blockage in the system because limited resources are targeted towards patients suffering from common mental health disorders. Currently, there is a huge gap in with an increasing demand and limited supply of mental healthcare services. Misdiagnosis and lack of affordable treatment and access to better resources have been one of the biggest problems in the delivery of mental healthcare. There are no tools for self-assessment and management that are easily available to people suffering from mental illnesses. Mental healthcare is not integrated into physical healthcare and therefore there are no indicators for people to track their wellbeing. Sachin realized that the only way to bridge the gap of the ever-increasing need for mental health professionals and services was to enable every individual to take charge of their own wellbeing. He is making prevention tools available to all while fostering a preventive care ecosystem in India that enables those with the capacity to treat mental health disorders to optimize their resources to do so. TrustCircle has partnered with key players in the mental healthcare sector such as the Schizophrenia Research Foundation (SCARF) – a World Health Organization Collaborating Center for Mental Health Research – to not only digitize common mental health tests but also create new tests that can be made widely available. For instance, in partnership with TrustCircle, SCARF has digitized a test for early detection of psychosis, depression, and anxiety that they will roll out with 30,000 students in schools and colleges in Chennai through a tailored TrustCircle platform. SCARF has also agreed to make the test available for use by other institutions that have the capacity to provide treatment for psychosis. Having experienced watching his brother suffer through mental health challenges, Sachin recognized that one of the most important resources for people suffering from mental health disorders and their caregivers is a community of support, where people who, due to stigma, might not otherwise talk to people about their status or concerns can do so freely and access emotional and moral support. As such, Sachin built into the platform mHealthConnect, where TrustCircle users can connect to support groups. This online peer-to-peer community is bringing users together in a supportive environment where they can share their progress anonymously if they choose, find support and connect with others. Caregivers and social workers also join this community to seek or offer support. In addition to leveraging technology to enable self-management of mental health, TrustCircle is fostering a preventive care ecosystem by partnering with organizations and institutions that have a stake in mental healthcare and have the capacity to provide care to individuals who are detected with early onset of mental illness. TrustCircle tailors their platform for these partners to use with their communities. The partner can make their knowledge resources available for use by users, and the aggregate data from their community provides actionable information for them to target their resources. For instance, with the Dr Reddy Foundation, TrustCircle is a strategic partner to catalyze and promote mental health and wellbeing for vulnerable youth across all the Foundation’s livelihood skilling centres in India. The Foundation realized that the young people they were training for jobs were quitting jobs at a high rate due to lack of emotional resiliency. They are thus integrating an emotional learning and stress management program in partnership with TrustCircle to empower these socially vulnerable groups to take control of their own wellbeing. The Dr Reddy Foundation has already piloted the platform and is planning to use it to implement mental health tracking with over 8,000 young adults a year that come under their skilling program over the next three years. TrustCircle is also working on a new partnership with TATA Cancer Centers to integrate a preventative approach to emotional wellbeing for cancer patients and caregivers into their treatment program. Sachin is also talking to government agencies about integrating TrustCircle into the public healthcare system to ensure broad access for vulnerable populations. Although smartphone penetration in India is growing rapidly, Sachin is exploring a voice command system that would enable use of the tools on feature phones as well. Currently, TrustCircle’s public platform is being used by 4,000 public users, 50 percent of whom are regularly monitoring their mental health at least 1 to 2 times a week. The curated partner platforms will reach 60,000 to 80,000 users over the next two years. In addition to individual users, the platform is being used by medical professionals and institutions in clinical work to encourage their patients to track their status and by caregivers to monitor the people they care for over time. Sachin is also developing an on-demand care part of the platform, which will allow users to access paid services from mental health professionals. TrustCircle will validate participating professionals to ensure quality care for users, and once they’re validated, users will be able to connect with these professionals to schedule appointments. Welfare Govt. of India; Dr. Vandana Gopikumar, Founder, The Banyan; Dr. Thara Rangaswamy, Vice Chairman SCARF to grow through partnerships. Sachin is also an international advisor for the Movement for Global Mental Health, where he along with over 30 other global influencers is shaping up the strategic direction for global mental health movement. Sachin grew up in the small district of Ambala in northern India, with his parents and younger brother, Salil. At one stage growing up, he realized that his generally happy and bubbly younger brother looked very troubled and quiet. Sachin's parents and teachers had missed that Salil was acting differently at home and school. Salil was being bullied at his school and that pulled him down emotionally. Teachers and family missed picking up these early signs of emotional turbulence Salil was going through and there was no early intervention in his case. Sachin realized that his brother needed emotional support to recover from the trauma, but since his brother’s brain had no signs of physical pain- the doctors did not provide the early intervention Salil needed and his brother flipped from wellness to illness in a snap. Sachin’s brother could never recover from the trauma of his early childhood. Sachin and his parents struggled to find their path forward and faced stigma. Sachin remembers the never-ending wait in the waiting rooms at Salil’s doctor's office where there were many other families going through the same experience. He began chatting with them and created a circle of trustworthy individuals whom his family could ask for support and share their son's progress with. This circle became his lifeline and through them, he and his family were able to find help. He realized the key role participation played in reducing alienation for patients and families. He wanted to make this waiting room experience available to everyone in their pockets. He went on to study in prestigious institutions globally, seeking the skills he needed to make this possible. During his journey as a software and technology consultant, he noticed that in the global organizations where he worked, most employees were overworked because organizations look at employees as resources and not as human beings. He noticed that most organizations that had a high attrition rate did not invest in their employees as humans. Along the way, he also met various people who only opened up about their own experiences with mental health disorders when Sachin shared about his brother, so he started talking to everyone he could about mental health. It became clear that in addition to the lack of support structure, there was very little in the way of early detection and prevention. Sachin observed clear gaps in the system around prevention, participation, and prediction. By 2016, he had quit his job and launched TrustCircle.